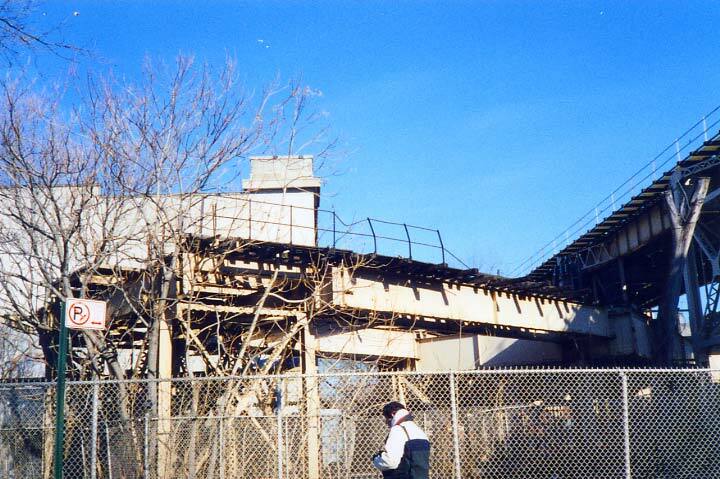 This small remaining piece of the 9th Avenue El at River Avenue in the Bronx, shown here in 1999, was eliminated between 2007 and 2009 when the New Yankee Stadium was constructed on the west side of River on the old space formerly occupied by John Mullaly Park at East 162nd Street. The 9th Avenue El, which had its origins in the 1860s, ran up Greenwich Street, 9th Avenue, Columbus Avenue, West 110th Street and 8th Avenue to its northern Manhattan limits at the old Polo Grounds, then was bridged across the Harlem River and actually ran under a tunnel in a Bronx promontory before emerging on the other side of the cliff, merging with the Jerome Avenue El at River Avenue and 162nd. Service ended in the early 1940s on most of the line, but a short stretch of the el served as a shuttle line between the IND 155th Street station and the IRT 167th Street station until 1958. The service was ended when the Giants fled the Polo Grounds for San Francisco. Even though most of the connection track has been torn down a small piece of it can be seen here on River Avenue north of Gate 8 of Yankee Stadium. Here on Jerome Avenue on the west side of New Yankee Stadium, there’s a high concrete wall painted blue. Above the wall is the platform and trackbed of the former Jerome-Anderson Avenue station where the el emerged from the tunnel. The East 162nd Street street sign was orphaned when the street was eliminated during the stadium construction. I visited the platform and tunnel with other foam…er, trainbuffs in 1999. “Comment…as you see fit.” FNY Comments are once again active! 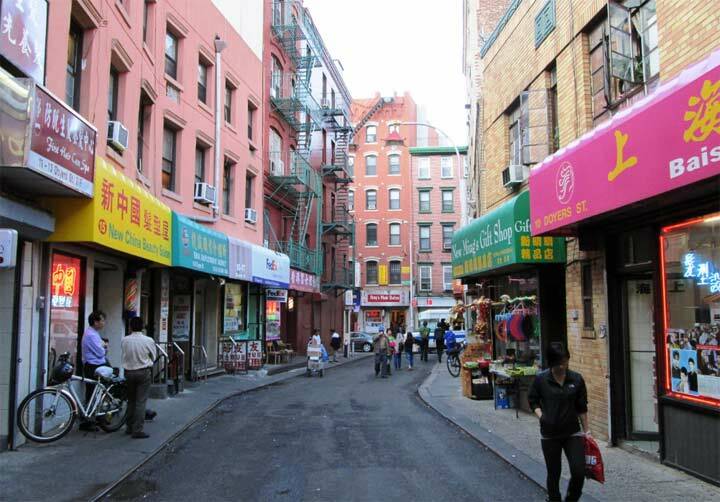 The connection from the 9th Ave. El to the Jerome Ave. El was built as part of the Dual Contracts, a massive expansion of the NYC subways between 1913 and 1931 that resulted in most of today’s IRT and BMT routes. The Jerome Line was built during this period so the 9th Ave. El extension, when looking at a map, was a logical piece as well. To accomplish the connection, the IRT took over the Putnam Bridge over the Harlem River, which was the route of the NY Central RR’s Putnam Division, whose original terminal was at 155th Street adjacent to the Polo Grounds. When the IRT took over the “Put” moved its terminal to the Bronx side of the river adjacent to the Sedgwick Avenue El stop. Train service on the “Put” ended in 1958, another impetus for closing the 9th Ave. El stub. It’s also important to note that the opening of the IND Grand Concourse subway, in 1933, cut into much of the 9th Ave. El patronage along the Jerome Line. When NYC took over the IRT (and BMT) in June 1940 as part of Subway Unification plan championed by Mayor LaGuardia, the 9th Ave. El south of 155th Street was immediately closed. Having the D train along the Concourse allowed West Bronx residents to continue to have a one seat ride to the West Side of Manhattan. So there’s still a fragment of my old Polo Grounds Shuttle standing? Perhaps the Giants will still come to their senses, and come home again! In case folks haven’t seen this, there is a 26 minute video on youtube of film of the 9th Ave El in action. Fascinating. I remember first seeing the 9th Avenue El stub in the early 1990’s, just when I was getting into railfanning. I wondered what the heck that stub was and where it led. The IRT and BMT systems still have so many mysteries. 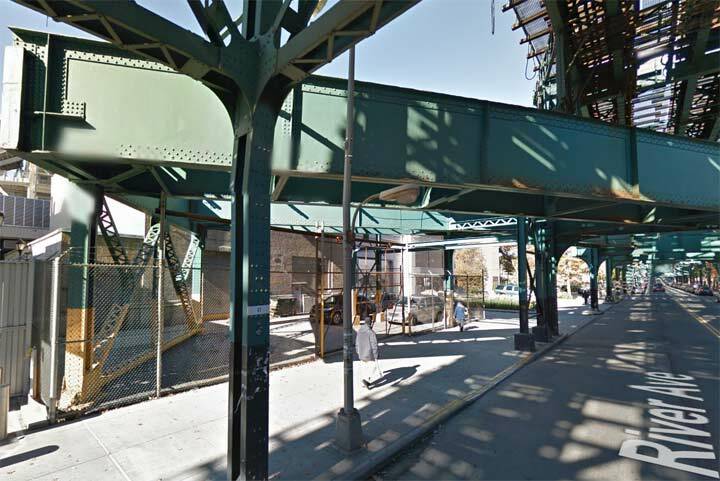 As a child I lived at Jerome Avenue opposite PS 114, and I remember that dead branch line, the tunnel through Highbridge, and the tracks going over Jerome Avenue, well. Always wondered what it was, but didn’t learn anything until years later. 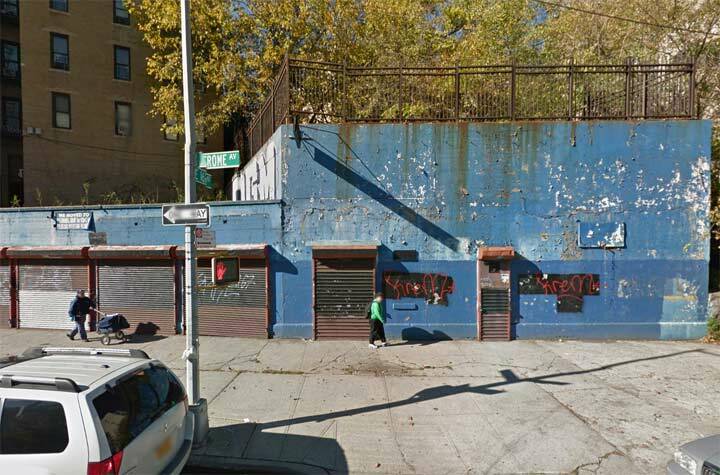 There’s an odd video on YouTube called “Return to the Ninth Ave. El” where the videographer shows where the El turned into (under) Anderson Ave in Highbridge. Well worth a look, though.